Next month we are headed West for America’s largest design show, Dwell on Design. Taking place in Los Angeles (June 24-26), this three-day event is going to be epic. This is our first time joining the event and we are as excited as a 5-year old kid on Christmas morning. Besides looking forward to finally soaking in some sunshine, there are so many things we are looking forward to at the event. Stimulating talks by a diverse panel of speakers. – Next to Connect: What Smart Tech Innovations Await? Taking part in the exhibition space. Arcbazar is not simply attending the event. We will also be exhibiting. For the last 4 months, together with our partners BuiltWorlds, CannonDesign, AIA Chicago, Dwell on Design, GreenApple Campus, Autodesk, and Forum8, we’ve been running a competition for the design of the Obama Presidential Library. While non-binding, this competition has been running in parallel with the selection process by the Obama Foundation. Over 400 designers and architects are using our platform to submit their ideas, fighting for the $10,000 prize! Zebra Imaging is turning the winning design into a hologram and we will be bringing it to the exhibition floor at Dwell on Design. This year Dwell on Design is partnering up with imm cologne – an international interiors show that takes place annually in Cologne, Germany. Arcbazar, while headquartered in Boston, is a truly international platform. Our network of clients and designers is made up of creative minds in Russia, UK, Nigeria, Australia, Thailand, Brazil, Japan, South Africa, Bulgaria – the list goes on. As such, we always look forward to opportunities to meet designers and architects from outside of our home country. Some of the design firms joining Dwell on Design on behalf of imm cologne are Istanbul’Dan (Turkey), My Kilos (Germany) and d signed by (France). While there will be three different tours, it’s the East Side/Hill one that we are most looking forward to. 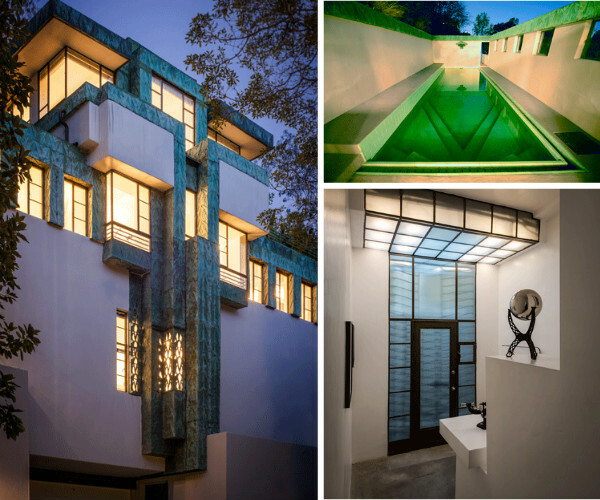 The Samuel-Novarro House, for example, was designed by a fantastic architect Frank Lloyd Wright Jr, the son of a legendary architect, interior designer, writer and educator Frank Lloyd Wright. The exhibition floor will be buzzing at all times. How could it not! With so many design firms, manufacturers and tech solution providers, we don’t think three days is enough time to meet everyone we’d love to. We will try our very best to do so, however. Some of the fellow exhibitors we definitely will make our way to the exhibition stands of are Haier America (a new kind of appliance brand focused on home solutions designed for each stage of the emerging consumer’s life), build.com (an online retailer that carries over 1 million home improvement products), ETwater (a company that’s changing the world with a focus on technology products for sustainability) and Woodbury School of Architecture. Why these exhibitors? Arcbazar is a network business. We are constantly on the lookout for new technological solutions, partners to address the issues of sustainability and environmental progressivism with and young talent to join our network. Our advisors come from MIT Institute of Design and Harvard Graduate School of Design. We have recently partnered up with Arx Pax, an inspiring company that is changing the way we think of architecture to make it adaptable to natural disasters such as floods and earthquakes. We’ve been working with such tech partners as Autodesk and Forum8. The list goes on. Expanding out network has always been the key to our success, so we are eager to meet other exhibitors at Dwell on Design and explore new partnership opportunities. You never know where the next source of inspiration is going to be. We are looking forward to immersing ourselves in the creative, fast-paces energy of the event both during the official hours and informal after-hour events. The event is bringing together thousands of designers, architects, architecture fans, solution providers – people with different knowledge and experience. It is impossible not to get inspired when surrounded by such a vibrant, diverse group of people! We are only a month away from the event, so if you haven’t yet booked your ticket, make sure to do so. Join the Arcbazar team for this greatest design show of 2016! View the original post on Arcbazar.com.